Montego Bay Weather: No Problems, Mon! Montego Bay weather is what you would expect from one of the top destinations in the Caribbean islands. The current weather is available below. 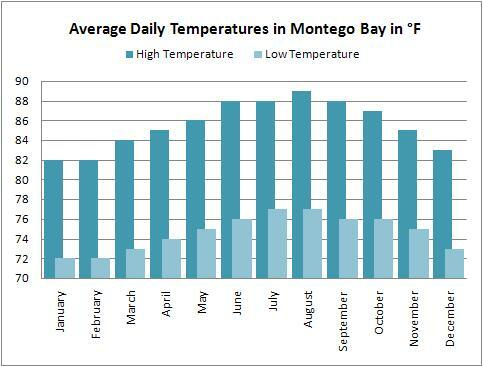 The monthly high temperatures for Montego Bay, Jamaica weather range from 82°F (27.8°C) in January and February, 89°F (31.7°C) in August. At night, the average temperature ranges from 72°F (22.2°C) in January and February to 77°F (25°C) in July and August. All of this means that Montego Bay (the locals often refer to the city as Mo'Bay) is an excellent spot for sunning and swimming for a week at one of its fabulous resorts or hotels, sipping on some Appleton Rum, strolling through the city, or spending the day away from your cruise ship. Weather in Montego Bay: Is There a lot of Rain? Being located on the western side of the island, Mo'Bay sees relatively little rain. During the first rainy season of May and June, you can expect an average rainfall of between 5.5 and 6 inches per month. The second rainy season in October and November sees a tad more rain, with a monthly average of 6 to 7 inches of rain. As seems to be the custom in Jamaica, when it does rain, it usually consists of a short, heavy shower that is soon chased away by the famous Caribbean islands sunshine. Hurricanes are few and far between in Montego Bay specifically and Jamaica in general. The island endures a direct hit from a hurricane on average once every 11 years or so, though it is grazed by these powerful storms slightly more often (once every 4.12 years). When it comes to the weather in Montego Bay, there are no problems, mon!